This book is the perfect starting point for anyone looking to promote and encourage mental health in their school, or evaluate their existing provision, in line with current government priorities. 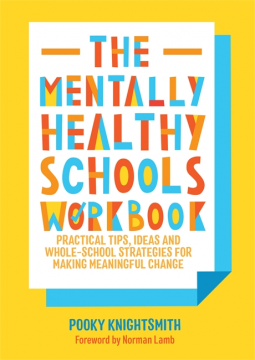 It covers not only the day-to-day practical steps you can take to meet the mental health needs of learners, but also a provides a whole bank of ideas for ensuring you adopt a whole-school approach to positive mental health. Pooky Knightsmith lays out tried and tested tools you can use to evaluate the overall mental health of a school, showing how to improve and support the mental health of staff, and how to ensure that the voice of every learner is heard and valued, including the most vulnerable - and that everyone involved with the school feels safe, healthy and happy. Pooky's simple 'litmus test' framework lays out six practical areas you can explore to implement change within your own school, with explanations, sheets to fill in, tips from loads of school staff, and case examples that break these ideas down into easily digestible chunks. This much-needed book is a jumping off point for meaningful change in all aspects of your school community that will promote, support and strengthen mental health at whole-school level.